The world is full of smells. Good smells and bad smells, pleasant and unpleasant smells, fragrant and pungent smells. Though the nose is not our most reliable advisor in perception — eyesight is far more important, as is well known — smells clearly have a say in our view of the world. And there is quite a lot to say about them, too. In Japanese, the most neutral term for verbalizing what only the nose sees is the noun 匂い (nioi, smell). It has a wide applicability, capturing both the smeller and the “smellable.” To start with the former, a distinction must be made between the intentional act of inhaling the odor of something, which is 匂いを嗅ぐ (nioi o kagu, to sniff something), and the act of being smelly oneself, which is expressed by the verb 匂う (niou). In English, both receiver and emitter just smell. As to the latter, 匂い attaches to any real or perceived source of a smell, such as 醤油の匂い (shōyu no nioi, the smell of soy sauce), 学校の体育館の匂い(gakkō no taiikukan no nioi, the smell of a school gym), or 雨上がりの道路の匂い (ameagari no dōro no nioi, the smell of asphalt after rain). The noun normally combines with the verb する (suru, to do), as in, say, 足の匂いがする (ashi no nioi ga suru, it smells like feet) or ブルーチーズの匂いがする (burū chiizu no nioi ga suru, it smells like blue cheese). Sometimes it’s difficult to tell the difference. This brings us to the darker side of the olfactory world, in which 匂い is often spelled 臭い (nioi): 生ごみの臭い(nama-gomi no nioi, the smell of kitchen garbage), 公衆便所の臭い (kōshū benjo no nioi, the smell of a public toilet), 下水の臭い (gesui no nioi, the smell of sewage) — well, no need to dig any deeper here. Note that things that smell bad do not just 匂う (niou, smell), they are downright 臭い (kusai, stinky). Examples are 汗臭い (asekusai, smelling sweaty), タバコ臭い (tabako-kusai, stinking of cigarettes), and 酒臭い (sakekusai, having boozy breath), to name but a few. Incidentally, the Sino-Japanese reading of 臭 is shū, contained in terms like 悪臭 (akushū, bad smell), 口臭 (kōshū, bad breath), and 加齢臭 (kareishū, smell of older people). But let’s move away from such odious odors and turn to more pleasant perfumes. For things that smell really good, the term 香り(kaori, scent, flavor) applies. 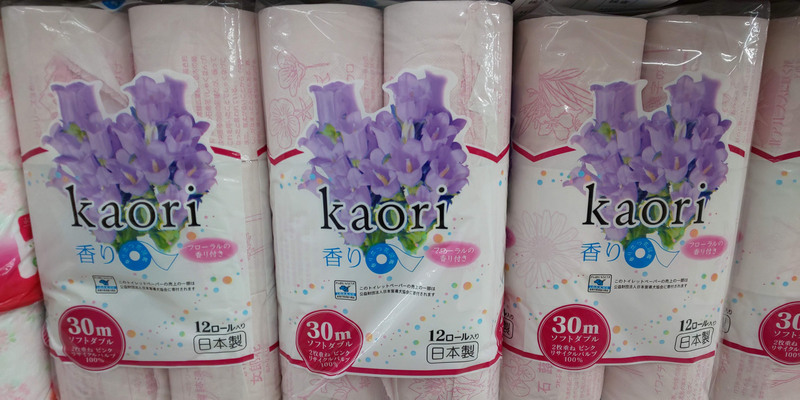 ラベンダーの香り (rabendā no kaori, the scent of lavender), for instance, or 柔軟剤の香り (jūnanzai no kaori, the smell of fabric softener). The standard Sino-Japanese reading of 香 is kō, as in 香水 (kōsui, perfume), 香辛料 (kōshinryō, spices), and — indispensable for Japanese summers — 蚊取り線香 (katori senkō, mosquito coil). 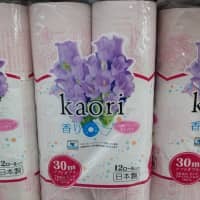 Due to its positive connotations, 香 also occurs in place names, most notably 香川県 (Kagawa-ken, Kagawa Prefecture) and 香港 (Hong Kong, literally, fragrant harbor), and in person names, such as 香里 (Kaori) or 桃香 (Momoka). Another concept of good smell is 芳しい (kanbashii). This one, too, is a frequent component in person names, for instance 芳江 (Yoshie) or 邦芳 (Kuniyoshi). In addition, it is a favorable ingredient in (somewhat outdated) hyper-polite expressions, intended to invoke the other person’s good smell. Best-known perhaps is 芳名 (hōmei, your honored name), but there is also 芳信 (hōshin), 芳書 (hōsho) and 芳翰 (hōkan), all of which refer to a letter or other correspondence most humbly received. As these examples indicate, the language of smell is often used for entirely metaphorical purposes. Similarly, there is お金の匂い (o-kane no nioi, the smell of money) or 犯罪の匂い (hanzai no nioi, the smell of crime), neither of which to my knowledge emits much real smell. Likewise, unfavorable situations such as poor business performance or bad test results are often described as 芳しくない (kanbashikunai). Rather “un-fragrant,” that is. For even fouler smells, metaphorically speaking, 臭い (kusai) comes back in. The list of nonflattering expressions that end in 臭い is quite extensive, including 古臭い(furukusai, outdated), 泥臭い (dorokusai, unrefined, unpolished), 田舎臭い (inakakusai, provincial), 面倒臭い (mendōkusai, troublesome), 貧乏臭い (binbō-kusai, shabby, dingy), 素人臭い (shirōtokusai, unskilled, amateurish), オヤジ臭い (oyaji-kusai, like an old man), どんくさい (donkusai, slow, clumsy), インチキ臭い(inchiki-kusai, fishy, dubious), and 胡散臭い (usankusai, suspicious, questionable). And then there is this wonderful Japanese saying that goes 臭いものに蓋をする (kusai mono ni futa o suru). It corresponds to the English idea of sweeping something under the rug. The difference is that the Japanese version is much more smell-sensitive: Put a lid on the stinky thing. Now that smells like trouble.